For a seating area that's their very own, give them the Lipper Mystic Table and Chair Set - Pink. This table and two-chair set is perfect for little ones who like to draw, write, color, or do anything else creative. 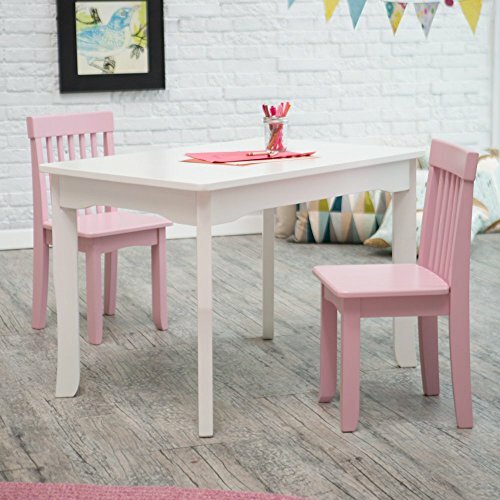 Constructed of beech, pine, and medium density-fibreboard (MDF), this classic set is finished in pretty pink and crisp white, making it a beautiful addition to any playroom. After they've completed their masterpieces, simply clean the table with a damp cloth and mild soap and water. This set is sure to be a favorite for years to come. Table dimensions: 36L x 24W x 24H in.. Includes 2 chairs. Constructed of beech, pine, and medium density-fibreboard (MDF). Pretty pink chairs and crisp white table. Recommended for children ages 3-8 years. Clean using damp cloth with mild soap and water. Easy assembly required. Table dimensions: 36L x 24W x 24H in.